I love getting birth books in the mail. I love reading them and then adding them to my library. Though I strive for minimalism in my life, I can't seem to wean myself from birth books. I justify this by sharing them with others in my birth classes and in the community. I have been remiss in this review. I received, The Reluctant Midwife in the mail some time ago. It is the second in a series of novels by Patricia Harmon, author and midwife. I enjoyed her first novel, The Midwife of Hope River and reviewed that book some time ago. In the meantime I also listened to her biographical book, The Blue Cotton Gown on audible. I should review that one too, in the mean time- I loved it. The Blue Cotton Gown is a great read on the struggles of modern midwifery practice, insurance, business, clients, and all the joys and sadness that goes along with it. I highly recommend it. It made my nightly walks that much more beautiful as I listened. Good books on tape encourage exercise! But on to the task at hand- a REVIEW of The Reluctant Midwife! 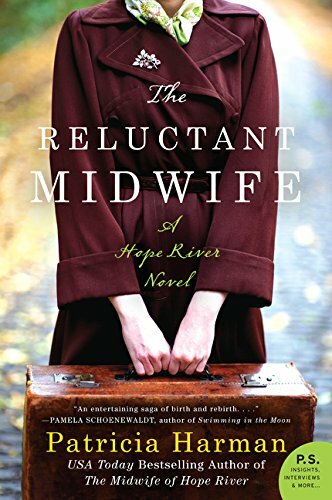 The Midwife of Hope River follows the "becoming" of midwife Patience Murphy as she starts a midwifery practice in West Virginia during the depression. The Reluctant Midwife focuses on Nurse Becky Myers, a friend of Patience. In The Reluctant Midwife, Patience is practicing less, since she is a busy mom, and Becky Myers must take over as the local midwife, despite her general squeamishness around birth. Thus the title, The Reluctant Midwife. The book is rich with nods to depression era history- CCC camps, forest fires, unions, miners, penny auctions and communities rallying together during times of hardship- which I always enjoy in a book. Some of the author's political leanings shine through a little here! But the real richness of the novel is the relationship between Nurse Becky and her ward, seemingly crazy ex physician Dr Isaac Blum, who she has also reluctantly taken under her wing. This was my favorite part of the book- their relationship and their growth as they work through their own issues to eventually become better versions of themselves. Yes, yes, yes!! I loved The Reluctant Midwife. (I also loved The Midwife of Hope River) I loved almost every word - -I read and reread it, at least 6 times--maybe more - - and never tired of it, learning more each time. That is my test of a well written book . . . thank you, Patsy!! Thanks for sharing. I would like to suggest to expecting mom's to vape tobacco eliquid verses than smoking. It is a much safer alternative to your health.